I got a bunch of local grapes last week from Greenling, but they weren’t very sweet and were full of seeds. So, I had to find a way to cook them, and fast, before they went bad. This jam is not only quick and easy (it took less than 25 minutes to make), but has some wonderful fall flavors from a bit of nutmeg, ground ginger, allspice, and cloves. In the picture above it was still warm and fresh from the stovetop, but as it cools it thickens to a more jam-like texture. I think I’m going to use it as a glaze over pork chops. I adapted this recipe from the Wild Grape Butter recipe that came in the Greenling box ingredient list last week – I just made some tweaks based on my own tastes. Combine grapes and water in a saucepan and bring to a boil. Lower heat to a simmer and cook 10 minutes. Pour grapes and juice into a strainer over a large bowl. 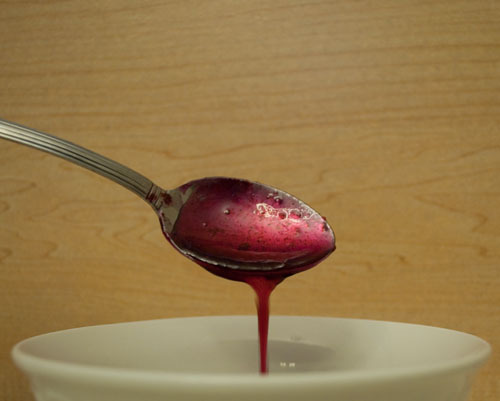 Using the back of a large spoon, press grapes through strainer. The pulp will go through and the peel and seeds will stay behind. Pour pulp and juice back into saucepan. Add peel and spices. Bring mixture to a boil, then reduce heat to medium. Cook 7-10 minutes, stirring constantly, until mixture thickens to a syrupy consistency. It’ll bubble a lot at the end. Use warm as a glaze, or cool to spread on toast.